Physical Location and Official Address are Different. Parking and building location for Pease Tax & Accounting Services, Inc. are on Gibraltar Dr South. From W Las Positas Blvd, turn onto Hacienda Dr. Turn left onto Gibraltar Dr South. Building and parking lot will be on the right side. Once in parking lot, head to the right. 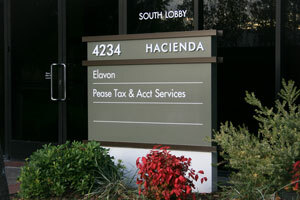 Look for the sign that says "Pease Tax & Acct Services". Note: After 6:00 p.m. on weekdays and all day on weekends, the door is locked. Please contact (925) 230-9380 to have the receptionist open the door. Pease Tax & Accounting Services, Inc.